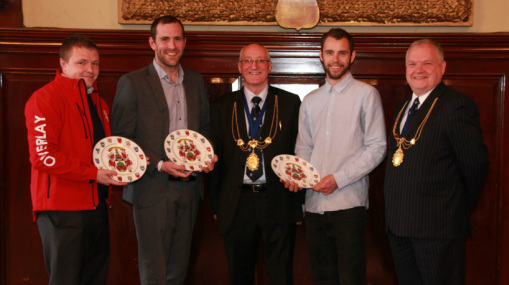 The Lady McDonald Lecture was held on 22nd May 2014 and was attended by over 100 people mainly from the three main construction colleges in Glasgow: City of Glasgow College; Kelvin College and South Lanarkshire College. The idea had been proposed initially by college at one of our Incorporation/College Staff meetings. The aim was to create a forum where we could enthuse and encourage students who were entering the construction industry to understand some of the great opportunities that exist today. The First speaker was Roddy McDowall. Roddy started off as a stonemason before retraining as a Sculptor in London. Roddy is in the process of creating a statue of St. Columbus for the Incorporation and this will be erected in the new City of Glasgow College Campus on Cathedral Street. Roddy had received financial support from the Incorporation to assist him to retrain as a sculptor. Roddy and Deacon Craig used a question and answer technique to bring out the salient points that he wished to make. The second speaker was David Gilmour who had been started off as a pre-apprentice before commencing his apprenticeship as a Roof Slater. David has gone on to become a very successful young man and has gained two Higher National Certificates, a Higher National Diploma, a First Class Honours Degree in Construction Management and has nearly completed his Master of Science Degree. David is the Construction Manager at Hampden Park. David caught the imagination of all the pre-apprentices present with the story of his rise from shop floor to management. After his talk, David was crowded by a large number of students wanting to know more in the hope that they could emulate his rise to success. 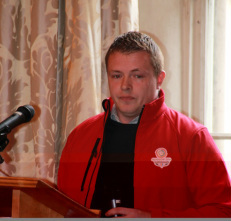 The last speaker was Andy Blyth from the Tree of Knowledge, a company who give inspirational talks and training. 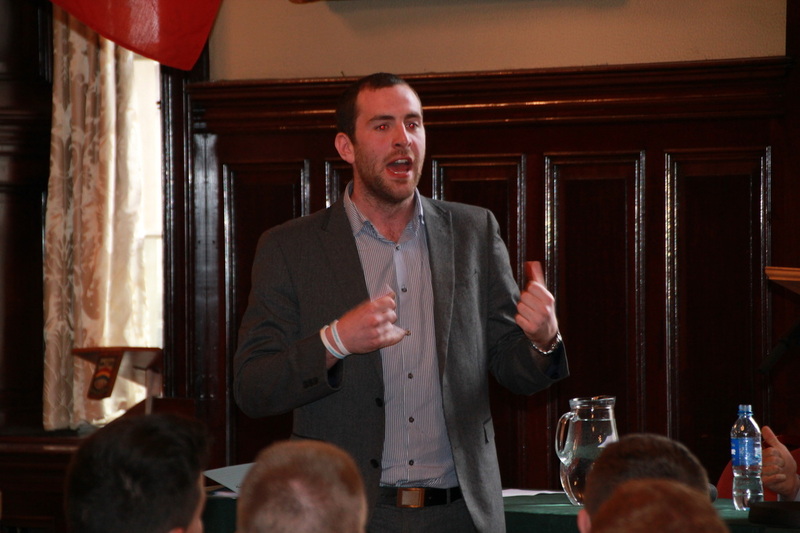 Andy has a background in sports psychology and used the latest research to maximise the performance of the audience. He soon had them participating in the talk and this was not a one way session, everyone present was fully involved. Andy's talk was humorous whilst at the same time he got his message across and made everyone realise that they could achieve much more than they had thought possible. At the end of Andy's session there was a question and answer session which brought out a few other issues of interest to the audience. At the end of the Lecture the Deacon presented the three speakers with a Trades House plate as a small thank you and reminder of the Trades House. Many students asked to have their photographs taken with the speakers and the Deacon after the presentation. To view a video of the lecture pleased click here. 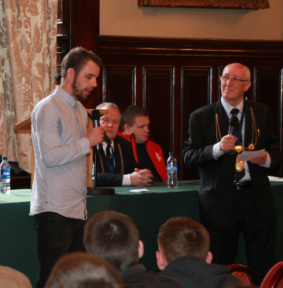 All photographs on this page were taken by Ian Thomson of City of Glasgow College. Our thanks go to Ian Thomson and the College for permission to publish the photographs.